The Minimalist Thermostatic Bar Valve and Pro I Telescopic Shower Kit from Hudson Reed is part of our contemporary collection of bathroom products. A rigid riser kit provides your bathroom shower with a solid base, a fixed pole and shower head in one. It has a built-in diverter so you can switch between the fixed head or hand held shower. The exposed thermostatically controlled bar valve, constructed from solid brass with a chrome finish. The handle on the left controls the water flow, whilst the handle on the right controls the temperature. Thermostatic showers prevent a fluctuation in temperature whilst the shower is running - prevents the risk of scalding, or sudden cold spells! 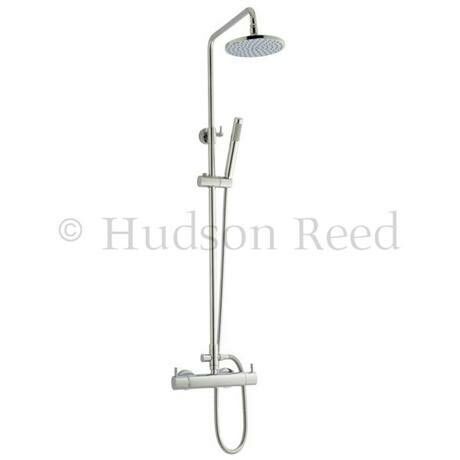 Give your bathroom a makeover with this Hudson Reed Thermostatic Bar Valve and Pro I Telescopic Shower Kit.